There's only one problem with this dress: I have to give it back. I realize it's a little difficult to see the detail of the neckline from these photos, but I couldn't resist pairing it this jacket I've been waiting to wear. It goes with absolutely everything, so get used to seeing plenty of it this fall. Happy Friday everyone! I don't have class today, so I get to lounge around until I bake cookies with my friend, Jennifer, who took these lovely photos. Hope you all have just as a relaxing day! Also: I am finally going to start doing blogger button/ad swaps! Both Katherine and Marlen were kind enough to help me by making buttons for me (since, as I told them, I'm incompetent) so if you're interested, just email me at elanakat@gmail.com! Also while I am here- I took pictures of the skirt last week, but I've had an outfit for my surprise item laying out for over a week and its just been SO COLD to wear! I am for sure going to do it this weekend and just have to layer layer layer! But, you will be getting them back shortly :)Thank you! This dress is adorable and totally you. Love it. Have a great weekend! Wow, that dress is gorgeous. Beautiful color! This dress is so lovely! And I love your bag, too! The colors are beautiful. I've been eyeing a few Melie Bianco items for a while now but have never actually bought any. Yours is lovely, though! That dress certainly is lovely! I'm also very much liking that bag! A gorgeous look on you! Excited to see the rest of the photos. Aw man, so sweet that you got to wear this dress at least - is it possible you could permanently swap them? ;) Haha, it really does look lovely on you! The pleats and soft blue color are just gorgeous! Loving the oxfords you paired with them and the cute bag also. This dress is totally better on you! I love the beige trench. Totally brightens to the blue. This dress looks great on you and I love the shoes. I think they both contrast nicely. I'll be checking out Flock Together regularly, can't wait to see what you guys do! Ahhhh I'm dealing with the same thing... also in Jessica's closet! She really has the cutest dresses and this one looks so pretty on you :). I'd have a hard time giving it up too! Uuuuh! The dress is so so pretty and so so elegant!!! Those shoes & sling bag - I want it now!!! Hi Elana! Missed you so much...it's been like two weeks since I've gotten a chance to get on blogger again :( but anyway. 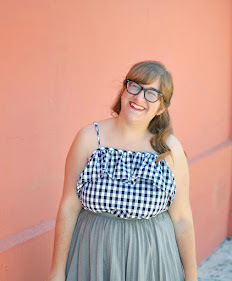 Wonderful outfit post~ I adore the bracelet and the color scheme of your little purse. I think they add such a nice touch :) It's Monday, which is always the nation's dreaded day of the week, but hopefully you're having a good one. I have this very same dress in pink so I might be just a bit biased but I love it!! It looks absolutely fabulous on you and I love how you've paired it with a trench (pastel colours together look so amazing!) and then gave a pop of colour/contrast with your tights and both awesome bag and shoes!! One of my favourite outfits of yours for sure, you look adorable!